Printed Batteries: Materials, Technologies and Applications reviews the current state of the art for printed batteries, discussing the different types and materials, and describing the printing techniques. It addresses the main applications that are being developed for printed batteries as well as the major advantages and remaining challenges that exist in this rapidly evolving area of research. 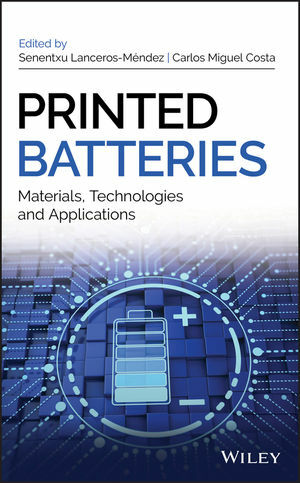 It is the first book on printed batteries that seeks to promote a deeper understanding of this increasingly relevant research and application area. It is written in a way so as to interest and motivate readers to tackle the many challenges that lie ahead so that the entire research community can provide the world with a bright, innovative future in the area of printed batteries. Topics covered in Printed Batteries include, Printed Batteries: Definition, Types and Advantages; Printing Techniques for Batteries, Including 3D Printing; Inks Formulation and Properties for Printing Techniques; Rheological Properties for Electrode Slurry; Solid Polymer Electrolytes for Printed Batteries; Printed Battery Design; and Printed Battery Applications. Printed Batteries: Materials, Technologies and Applications is a unique and informative book that will appeal to academic researchers, industrial scientists, and engineers working in the areas of sensors, actuators, energy storage, and printed electronics. SENENTXU LANCEROS-MÉNDEZ, PHD, is Ikerbasque Professor at BCMaterials, Basque Center for Materials, Applications and Nanostructures, Spain and Associate Professor at the Physics Department of the University of Minho, Portugal. His work is focused in the area of smart and multifunctional materials for sensors and actuators, energy, and biomedical applications. CARLOS MIGUEL COSTA, PHD, is Researcher at the Physics and Chemistry Centers of the University of Minho, Portugal. His work is focused in the development of advanced polymer composites and novel materials and formulations for energy storage applications, including lithium-ion batteries, sodium-ion batteries, and printed batteries.